Copyright 2015 Thomson Reuters. All Rights Reserved. 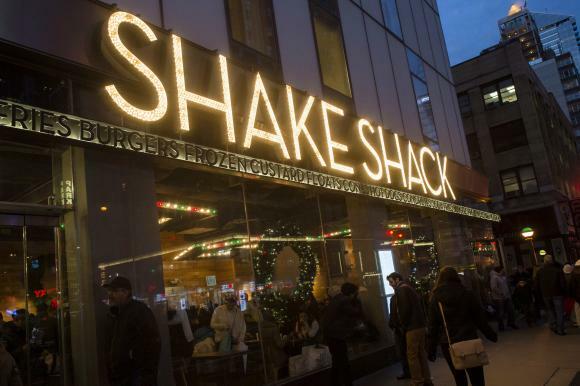 NEW YORK, Jan 2 (Reuters) – Shake Shack Inc’s filing this week for an initial public offering underscores a question for investors and foodies alike: How hungry are U.S. consumers for another burger chain? A key part of Shake Shack’s growth strategy involves expanding its locations beyond its New York base, and investors and analysts are bullish on its prospects. They say there is room for more “fast casual” restaurants that offer higher quality burgers, a variety of toppings and in some cases, beer and wine. Shake Shack’s burgers are described in its preliminary prospectus as all-natural and hormone- and antibiotic-free. To be sure, there are skeptics who say the excitement over Shake Shack is overblown. “Consumers love it and it will be well greeted in the market – and then probably fizzle out,” said Doug Kass, president of Seabreeze Partners Management in Palm Beach, Florida, and a noted short-seller. “That a company of such a small size can get a valuation is symptomatic of the silliness … that develops in a period of zero interest rates,” he said. A Shake Shack spokeswoman declined to comment. Still, several factors appear to be working in Shake Shack’s favor. First, 2014 was a solid year for restaurant IPOs, particularly of the fast casual variety. Burger chain Habit Restaurants Inc’s shares have risen 3 percent since its $30 Nasdaq debut on Nov. 20, based on Friday’s prices, and Zoe’s Kitchen was up 12 percent from its April market debut at $28.72 on Friday. Shares of El Pollo Loco, another fast casual company, were up 5.5 percent Friday from their $19 market debut in July. Second, premium burger chains are outperforming the burger category as a whole, thanks to demand from younger, more affluent consumers. Sales at such chains including Five Guys and Smashburger rose 9 percent in 2013, according to restaurant consultancy Technomic Inc, while overall sales at all burger chains including fast food restaurants such as McDonald’s Corp were down 1 percent. “The better burger space has been a pretty disruptive force for McDonald’s and other players,” said Darren Tristano, executive vice president at Technomic. Shake Shack has developed a fervent following since it was founded by restaurateur Danny Meyer in 2001, but the challenge will be to replicate the success it has found in New York in the rest of the United States and overseas. The company has 31 company-operated and five licensed locations in 10 states and Washington, D.C., and 27 locations abroad. The chain believes it has the potential to increase the number of domestic company-operated Shacks to at least 450 and analysts say that finding new locations with affluent consumers is critical. Consumers such as Leticia Garza, 33, a middle school teacher in Austin, Texas, help illustrate the brand’s potential in other parts of the country, but also the challenges. Garza says she is excited to hear that Shake Shack planned to expand to Austin. Indeed, the market may be just a few years away from being saturated with too many fancy burger places, some analysts say. Furthermore, premium burger chains are not the only ones offering more personalized options: McDonald’s is rolling out a new “Create Your Taste” program this year that will give customers a choice of sandwich toppings. In December, the world’s biggest fast food chain, which has not had a monthly gain in sales at its established U.S. restaurants since October 2013, said it also planned to cut the number of items on its U.S. menus. It also plans to use fewer ingredients in food, in an effort to reach consumers who want simpler, more natural choices. McDonald’s is cheaper than Shack Shack and competes for a less affluent consumer. Still, industry watchers say such efforts could put pressure on premium burgers. This entry was posted on Wednesday, January 14th, 2015 at 8:00 am and is filed under Burger, Eco Friendly, Fast Casual, Food, Health & Wellness, Ingredient, Menu. You can follow any responses to this entry through the RSS 2.0 feed. You can leave a response, or trackback from your own site.